I decided that my photo for this past weekend had to include something about the schools I have attended. Why? Interestingly (and very pleasantly) several people from my past decided to get in touch with me recently. In fact, when I stopped to think about it, I realized that one of these old friends was from Smith, one was from my time at NYU, and one was from my first couple of years at Princeton. Can you spot a theme after reading a bit about these people? Wendy I met in college while hanging out in the Computer Science Department lab a lot. Cecil was our tech support guy at NYU where we shared an office, sort of, since as the departmental Web master I got to have some nifty space in the IT corner. And Paul was getting a Master’s degree in Engineering from Princeton where we were part of the same entering cohort of graduate students (me in Sociology). I haven’t been in touch with any of these people in at least five years so it was a delight to hear from them. And all on the same weekend, it had to be commemorated. 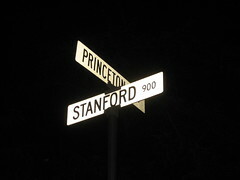 It occured to me that Stanford has a row of streets named after colleges and universities. On Sunday night I went looking for the street called Princeton and the above photo is the result. Here it is from another angle. But I picked the above photo, because I preferred its composition. This entry was posted on Wednesday, November 1st, 2006 at 10:40 am	and is filed under People, Project 365. You can follow any responses to this entry through the RSS 2.0 feed. Both comments and pings are currently closed.